Paete, a Laguna town proud of the title "Carving Capital of the Philippines," with artists' blood intrinsic in every Paetenian's veins even before the Spaniards came, and yet the carving industry is in a moribund state due to numerous reasons. There currently is a dwindling number of sculptors carving wood due to the scarcity of the precious item from fallen trees. The carving industry also gave birth to the taka (papier mache) industry, mostly led by the womenfolks, but is also in its twilight years unless the people and government find ways to arrest the problem. While vacationing in Paete, Tutubi chanced upon his neighbor at work, a veteran wood carver still churning out made-to-order religious items. The country's total log ban resulted in the dearth of wood making life hard for the carvers, made worse by government indifference (and politicians full of empty promises), lack of fresh ideas of some carvers, increased competition and unethical business practices. 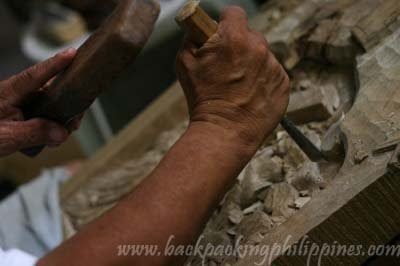 Sculptors nowadays turn to other medium e.g escayola (plaster of paris), resin, and others in lieu of wood to carry out their sculpting pursuits. 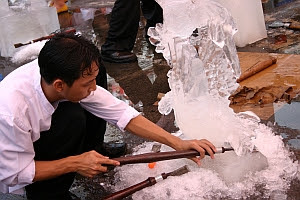 New generation of sculptors now work as kitchen artists in hotels and restaurants here and abroad mostly working with ice, vegetable, butter and chocolate creating astounding centerpieces. Here's a tip: if you're looking for the usual religious items, souvenirs, there are many handicraft stores and souvenir shops at the town center (mainly on Rizal, Quesada and F. Sario St.). There are also sculptures, besides paintings,on display at Kape Kesada. 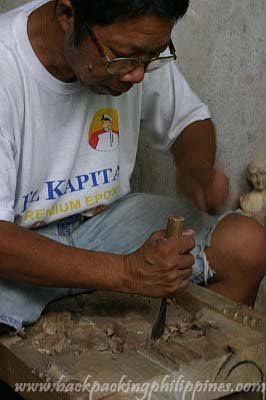 For custom-made wood carvings, you may get in touch with the woodcarvers themselves for discounts, usually much cheaper when bought in Manila. Rates and estimates are always in length/height of the image and the required finish. 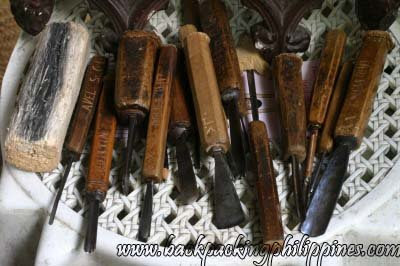 Other areas with carving traditions include Betis, Guagua in Pampanga, and people of the Cordilleras. A marriage of sculpting and painting, called "paintures," popularized by visual artists/brothers Manuel and Angelo Baldemor (a future post). Looking wood carvings stores and shops in Paete? Being a true-blooded son of Paete, he'll soon post a list of shops selling wood carvings and handicrafts, much cheaper that stores in Quiapo, Manila. If you want custom-made carvings, the going rate is usually per foot, say saints, and the final price depends on the finish i.e. varnish or paint (encarna) et al...just leave a comment! Paete has been in my list of places to visit for quite a while now... I wonder when? wow! i just saw this website and its great! i almost went back to paete for the first time in two years last week but i'll definitely go there again. wonderful talents! beautiful works of art!!! wowwww!!!!! 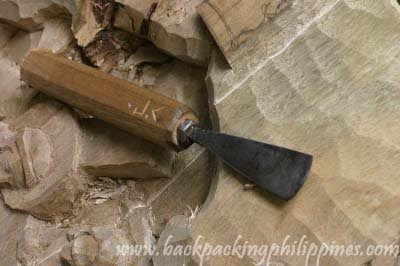 Certainly wood carving isn't easy; the amount of patience needed also the skills! Pero, it's amazing talaga! I too have been wanting to go to Paete for a long time. Very creative people out there. i've been to paete once. really nice art. very creative artists! what's not good there is the very small road that causes traffic. best thing is to park somewhere and walk your way on the street that displays the wood carvings. these people have real artistic talents man. 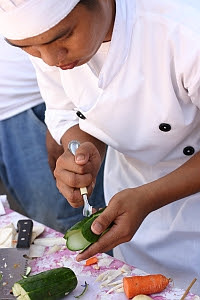 They just go and do their thing without much preparation - awesome ! What wonderful work of art - thanks for sharing! very talented people. their works could defintely light-up any place. The wood carving must be the more difficult of the disciplines, I guess. They certainly have my admiration those artists! they're really good! we once went there to scope out a possible taka (paper mache) exhibit. galeng galeng! Wonderful skills. Keep up the great work. Hi, do you have any contact nos. of artists / shops in Paete? I would like to inquire for custom made products. 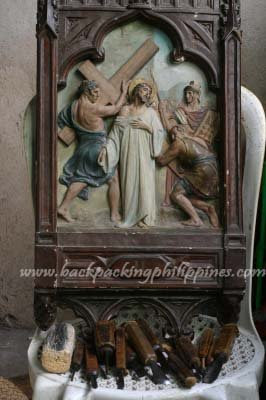 Hello, do you know anyone in Manila who does custom made carving wood works like this? Or contacts of shops/carvers in Paete? Please email me at kyragco@gmail.com need it urgently for a project. Thanks!